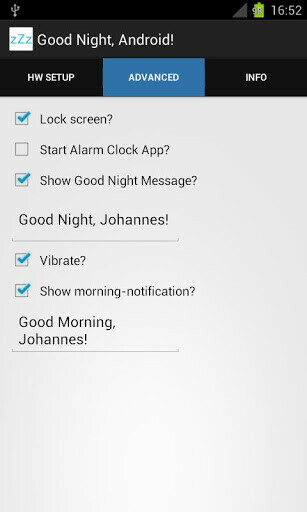 "Tired of switching 7 toggles before going to bed and again when you wake up?" - that's the rhetorical question Superkoal dev starts his new app XDA-Dev thread with. You bet we are, and the little radio toggle automation app he wrote has been up and running at the Play Store for a few days, fittingly called "Good Night, Android!" The app lets you set which radios and functions in the phone to be turned off or suspended during a predetermined amount of time, or with the tap of an icon on your home screen. Good Night, Android! doesn't run in the background after you activate the switch, so it doesn't drain battery in its turn. It's a handy little way to automate turning off all the power-sucking radios on your handset, but the free version won't automatically restore your settings in the morning, you'll have to do it manually, or $1.47 to the developer for the full version. There are several that do that already, ZDBox has a switch to "PowerSave" that you can customize as you wish (not automatic, you have to click it). The button can switch off: Wifi, GPS, bluetooth, vibration, etc Saddly I could not find an application to switch from 3G to 2G in such a maner... That also saves a lot of battery during the night. Many of the CM10 based ROMs have a built in option to turn off 4G/3G/use only 2G, and you can easily turn off background data - go to settings>data usage>menu>restrict background data (check it)...that works great - also, try CPU sleeper - you can get it free from XDA, or pay at Google Play store. I use "Phone Schedule", it's small and free (available in Play Store). Just turn on the Flight Mode during the night and turn it off in the morning. Works well.